Earliest attested version of the diagram, from a manuscript of Peter of Poitiers' writings, c. 1210. 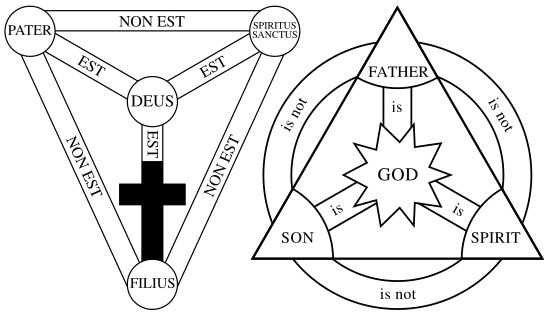 The Shield of the Trinity or Scutum Fidei (Latin for "shield of faith") is a traditional Christian visual symbol which expresses many aspects of the doctrine of the Trinity, summarizing the first part of the Athanasian Creed in a compact diagram. In late medieval England and France, this emblem was considered to be the heraldic arms of God (and of the Trinity). 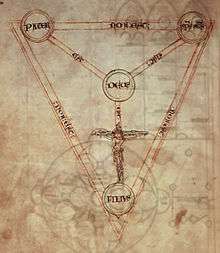 Petrus Alfonsi's early 12th-century Tetragrammaton-Trinity diagram, a probable precursor to the Shield of the Trinity. From William Peraldus' Summa Vitiorum, c. 1255–1265. Includes e converso ("vice versa") in the link captions to clarify that links are bidirectional. 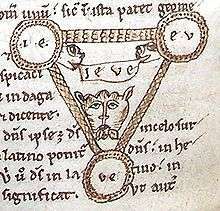 The precise origin of this diagram is unknown, but it was evidently influenced by 12th-century experiments in symbolizing the Trinity in abstract visual form — mainly by Petrus Alfonsi's Tetragrammaton-Trinity diagram of c. 1109 (and possibly also by Joachim of Fiore's different Tetragrammaton-Trinity diagram of three circles, which in turn led to the Borromean rings being used as a symbol of the Trinity ), in combination with the Athanasian Creed. The Shield of the Trinity diagram is attested from as early as a c. 1208–1216 manuscript of Peter of Poitiers' Compendium Historiae in Genealogia Christi, but the period of its most widespread use was during the 15th and 16th centuries, when it is in found in a number of English and French manuscripts and books (such as the Sherborne Missal), and as part of stained-glass windows and ornamental carvings in a number of churches (many in East Anglia). 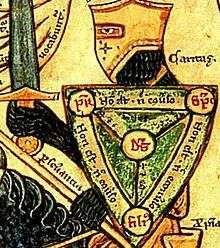 The diagram was used heraldically from the mid-13th century, when a shield-shaped version of the diagram (not actually placed on a shield) was included among the c. 1250 heraldic shields in Matthew Paris' Chronica Majora, while the c. 1260 allegorical illustrations of a knight battling the seven deadly sins in a manuscript of William Peraldus' Summa Vitiorum, and of a woman penitent fending off diabolical attacks in the De Quincy Apocalypse, show the diagram placed on a shield. 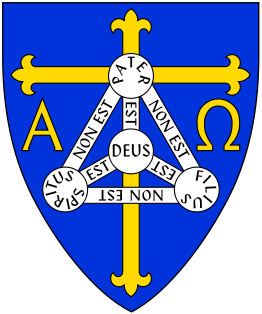 In the 15th century, one form of the Shield of the Trinity was considered to be the coat of arms of God (see discussion below). The use of the diagram declined in England with the rise of Protestantism, and from the 17th century to the early 19th century, it was mainly of interest to historians of heraldry; but beginning in the 19th century it underwent a limited revival as an actively used Christian symbol among English-speaking Christians, partly due to being included in books such as the Handbook of Christian Symbolism by William James Audsley and George Ashdown Audsley (1865). 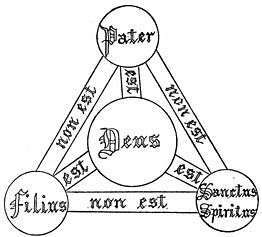 The only name for this diagram which was in any regular use during the Middle Ages was "Scutum Fidei" (a Latin phrase meaning "Shield of the Faith", taken from the Vulgate of Ephesians verse 6:16). For example, in this c. 1247–1258 manuscript of John of Wallingford's writings, the quote from Ephesians 6:16 is placed directly above the diagram. Four variants of the "Shield of the Trinity"
The diagram on a blue shield (heraldic "azure") was the coat of arms of the Priory of Black Canons (monastery of Christ Church) near Aldgate in the City of London (see also the 15th-century coat of arms attributed to St. Michael the Archangel and the modern coat of arms of the Anglican diocese of Trinidad shown below). 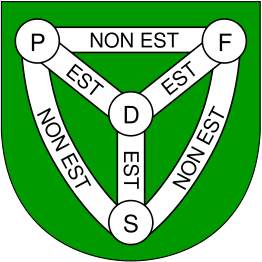 Two of the 13th-century manuscripts have the diagram on a green shield (heraldic "vert"), which is also found in the coat of arms of Trinity Parish, Jersey shown below. Green is the color of Trinity Sunday or the Trinity liturgical season in some traditions. In the Middle Ages, the shield-shaped version of the diagram was sometimes imagined as a protective shield wielded by the Archangel Michael, or by an ordinary soul, in the spiritual warfare against dark forces described in Ephesians chapter 6 (as in the c. 1260 allegorical illustrations in manuscripts of Peraldus' Summa Vitiorum and the De Quincy Apocalypse). Finally, a version of the diagram with translated English-language captions is shown in the illustration above. (For simplicity, the definite article could also be left out of the English translations of the outer node captions, as in the next illustration below.) In the Middle Ages, Latin was the liturgical language and main language of scholarship of Western Europe, so that Latin captions were then most often used (but at least one old rendition of the diagram in another language is attested in the c. 1260 Anglo-Norman French allegorical illustration in the De Quincy Apocalypse). The diagram below shows the earliest and most recent major variants of the "Shield of the Trinity" diagram: On the left, the form attested in various manuscripts c. 1208–1260 AD, and on the right the form popularized among some English-speaking Protestants in recent years by Paul P. Enns' 1989 book The Moody Handbook of Theology and H. Wayne House's 1992 book Charts of Christian Theology and Doctrine. Note that in the 13th-century manuscripts, the cross is often drawn as a detailed artistic illumination of Christ on the cross, which is not attempted here. A few authors of 20th-century books on Christian symbolism (such as Edward N. West in Outward Signs: The Language of Christian Symbolism, 1989) have been of the opinion that the form of the diagram with one vertex down and the captions "PATER" and "FILIUS" in the two top nodes is more appropriate for Western Christianity with its Filioque, while the form of the diagram with one vertex up represents more closely the doctrine of the Trinity in Eastern Christianity (without the Filioque) — though this hyper-refined interpretation does not agree with 13th-century usage, nor with the use of versions of the diagram with one vertex up by modern Catholics and Protestants. 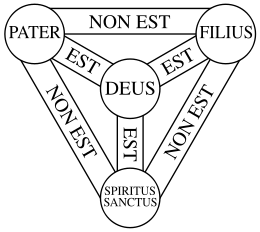 The main achievement of the Shield of the Trinity diagram is to transfer a large part of the essential "mystery" or "paradox" of the Christian doctrine of the Trinity from the realm of complex verbal philosophical abstractions and esoteric theological vocabulary to the realm of simple logic, as presented in the relatively easily graspable form of a concrete and conveniently compact visual diagram. It is remarkable as a basically successful attempt, roughly 800 years old, to represent a complex set of abstract concepts in precise graphic form (as opposed to many of the near-contemporary attempts of Joachim of Fiore and Raymund Lull, which were not so successful). Thus it is perhaps one of the oldest widely attested "graphs", in the sense of graph theory (technically, it is a complete graph on 4 vertices, the same as the vertices and edges of a tetrahedron). 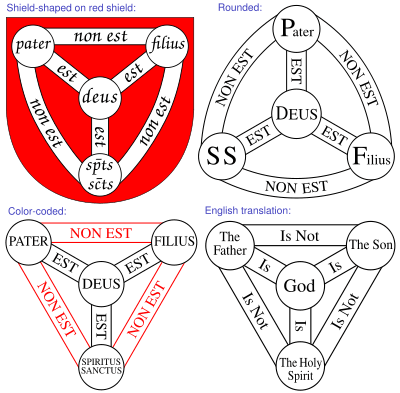 Wikimedia Commons has media related to Shield of the Trinity. Arms attributed to St. Michael in the 15th century. 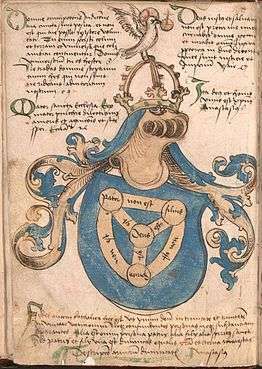 A full "coat of arms of God" in the Wernigerode Armorial (Southern Germany, c. 1490), with blue shield color, instead of the red used for the coat of arms of God in England. Folio 38r of the Abingdon Apocalypse (British Museum additional manuscript 42555, c. 1262) contains a form of the Shield of the Trinity, according to the Michael Evans journal article (however, without text, and with a superimposed central cross). The diagrams in Matthew Paris' Chronica Majora and the De Quincy Apocalypse (Lambeth palace ms. 209, folio 53r) are not online, but are shown in the Michael Evans journal article (also, a full-page color reproduction of the Lambeth Apocalypse illustration is on page 48 of the Rodney Dennys book). Redrawn version of illustration from a Book of Hours printed by Simon Vostre in Paris in 1524 (also reproduced in vol. 2 of Didron's 1843 Christian Iconography). The Sherborne Missal — illustration for Trinity Sunday in an early 15th-century manuscript at British Library online. See the coat of arms attributed to St. Michael ("Sent Myhell") in a 15th-century (c. 1460?) heraldic manuscript in the image at right.